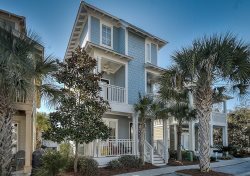 A Beautiful 1850 sq ft. 3BR/3Bath Gulf Front Condo at High Pointe Resort in Seacrest Beach with amazing views of the emerald green waters of the Gulf. Come enjoy stunning sunsets and tranquil ocean sounds from a deluxe condo on the 3rd floor end unit with panoramic views. It sits on one of the highest points on the Florida Panhandle! Comes with 3 adult bikes. The condo also comes with complimentary beach services, 2 chairs and 1 umbrella (Seasonal: March 1 to Oct 31 only)! Perfect for the beach! Master bedroom has a king bed, flat screen TV, and a private master bath with separate shower and garden tub with a closet and double vanities. Private balcony access to the gorgeous view of the gulf. Second bedroom to the right has two full beds with a TV, large closet, and private bathroom with a two sink vanity and shower/tub combo. As well as a private balcony access overlooking the gulf and sugar white beaches. This bedroom also has balcony access to view and enjoy the panoramic views. Third bedroom has a queen bed with flat screen TV, day bed for reading and relaxing, and bathroom access. Bathroom is also accessible from the hallway. It is a tub/shower combo with single vanity. The kitchen and dining room flow together with plenty of seating, which is perfect for gathering and enjoying family time and drinks. Views all around, it’s a unit you don’t want to miss. The kitchen has been renovated with sea glass back splash and new stainless steal appliances. The living room is cozy with a large couch, plenty of seating, and a large screen TV. Panoramic views from every angle, perfect for reading a book or beach watching. The unit also has Complementary Wi-Fi, and a full washer and dryer in unit. This unit is an extremely clean, non-smoking unit with tasteful furnishings. Kids and adults will love the easy beach access, convenient beach chair service, tiki bar and grill, new playground, tennis courts, and 6,500 sq. ft pool with waterfalls and lush landscaping. Crabby Steve's Ocean Front Bar & Grill is right on the property and is the only true gulf front dining experience on all of 30A. Fabulous dinner specials and always a fun place to unwind. 3) 3 bikes are included in the rental. To utilize, waiver must be signed and received before code provided. Please contact Saxon with Bikes 4U at 850.399.1230 with any bike questions.